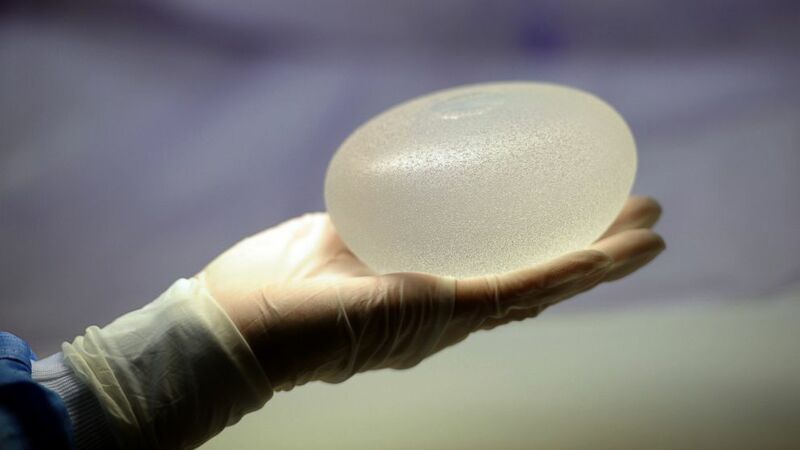 At least 359 women with breast implants were diagnosed with a rare cancer. camera (Miguel Medina/AFP/Getty Images) A technician presents a silicone breast implant in this undated file photo. A warning by the U.S. Food and Drug Administration (FDA) has raised new concern about breast implants risks and the possibility of developing a rare form of cancer called anaplastic large cell lymphoma, or ALCL. Here's key information about the new warning. When did the FDA first discover the link? The FDA first noticed a possible association between breast implants and ALCL, a rare type of non-Hodgkin's lymphoma, in 2011. "Women considering breast implants should be aware of the very small, but increased risk of developing ALCL and discuss it with a physician," Dr. Binita Ashar, a physician and FDA scientist studying these cancer cases, said in a statement on the FDA website in 2011. Ashar said, at the time, that most women were diagnosed with cancer years after surgery when they noticed changes in the look and feel of the area around the breast implant. They did not have enough cases then to determine a certain connection. After further research, the FDA announced yesterday that, in rare cases, they believe breast implants can lead to the development of ALCL. How many women have been affected? The risk of ALCL remains rare even in women with breast implants. The FDA so far has found 359 reports of women developing breast cancer-associated ALCL, including nine deaths. The majority of women who developed the cancer, 208, had a textured type of implant rather than a smooth implant. Additionally, 186 of the women who developed ALCL had implants filled with silicone versus 126 who had implants filled with saline. An estimated 1.7 million breast implantation surgeries were completed in the U.S. alone between 2011 and 2016, according to the American Society for Plastic Surgeons, so the risk remains low. "All of the information to date suggests that women with breast implants have a very low, but increased risk of developing ALCL compared to women who do not have breast implants," FDA officials said on their website. "Most cases of breast implant-associated ALCL are treated by removal of the implant and the capsule surrounding the implant and some cases have been treated by chemotherapy and radiation." The FDA stressed that those with breast implants do not need to change routine care and medical follow-ups. However, the FDA continues to recommend women with silicone implants have MRI scans to detect any potential rupturing -- and consult with a doctor if they notice any physical changes around the implant site. ABC News' Chief Women's Health Correspondent Dr. Jennifer Ashton said that people with implants should be informed of the potential risks, but stressed that breast implantation surgery is generally safe. "An increased risk of a rare event is still a rare event," Ashton said today on "Good Morning America." The FDA suggests patient should research thoroughly before having breast implants. Women considering implants should also remember they will likely need additional procedures or replacement in the future. They should research the range of different products, communicate with a surgeon and understand long-term risks, before deciding to have the surgery, and monitor any adverse reactions after. More information can be found on the FDA website. Dr. Carolyn Certo Gnerre contributed to this article. She is a third year psychiatry resident at Montefiore Medical Center in New York and resident in the ABC News Medical Unit.